Founded in 2015, The NU CORNO Ensemble is dedicated to commissioning and performing works written for horn ensemble with the goal of adding new works to the vast and wonderful repertoire for the genre. Over the past four years, the ensemble has commissioned over 15 works, presenting their world premieres on recitals at the 47th, 48th, and 50th International Horn Symposiums, along with the IHS and US premieres of works for horn choir. The ensemble is made up of a roster of internationally recognized horn players who come together at the International Horn Symposium to bring these new works to life. Throughout its four-year history, The NU CORNO Ensemble has collaborated with composers such as Kerry Turner, Eric Ewazen, Jenni Brandon, Dana Wilson, James Naigus, and Daniel Baldwin, among many others. For more information about the ensemble and the works it has commissioned and performed, visit www.nucornoensemble.com. Steven Cohen has been heard internationally as an orchestral, Broadway, and chamber musician. A freelance horn player based in New York, he is in demand as a recital soloist, as well as a guest with orchestras throughout the United States. 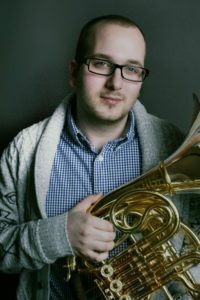 In February of 2019, Cohen was the first horn player to present a full recital on WQXR’s Young Artists Showcase, an internationally broadcast radio program, since the 1990s. He has been a featured artist at numerous horn workshops and events throughout the United States, and was a Contributing Artist at the 45th, 48th and 50th International Horn Symposiums. From 2010-2012, Cohen was Principal Horn with The New 25th Anniversary Production of Les Misérables. As a chamber musician, he has performed with the Inverness Chamber Players, as well as the Ad-Venturi Horn Duo, of which he is a member. A proponent for the creation of new music, Cohen has commissioned and premiered over 25 works for horn from a distinguished collective of composers. His debut album, Cruise Control, features the world premieres of five major works for horn, and has been heralded as “a musical and technical tour de force.” In addition, Cohen oversees The NU CORNO Ensemble, an ongoing project dedicated to the commissioning and performance of new works for horn ensemble. The group has been featured at three International Horn Symposia and introduced over 15 works into the horn ensemble repertoire. Cohen’s love of the horn far extends just being a performer. He has presented lectures at the national and international level. Cohen’s presentations, “from ON stage to UNDER it: Transforming from an Orchestral to Pit Hornist,” and “J.S. Bach: An Exploration of Teaching and Performance Practice,” have been presented at numerous International Horn Symposia, various national workshops, and universities worldwide. Aside from his presentations, he is sought after as a clinician, presenting masterclasses at universities throughout the United States. For more information, visit www.stevencohenhorn.com.